Ontario’s remaining three mass institutions for people with intellectual disabilities will close their doors forever on March 31, 2009. Join us in remembering those who lived and died in Ontario institutions, and help us celebrate real homes and real communities for people with intellectual disabilities. This is a historic day in the history of human rights development, not only in Ontario but across the country and throughout the international community. People with intellectual disabilities are emerging from the shadows of systemic incarceration to take their rightful place as fully valued citizens in their own communities. Following the exceptional documentary The Freedom Tour will be the touching short film Sheri & Paul, and a performance by David McKillop, an ex-resident of the Rideau Regional Centre. They saved every month and waited a year, and when the big day finally arrived on January 30 the excitement was only slightly stifled by the need to focus on clearing security and customs before boarding the plane to Florida. After eight years of travel to urban settings with a focus on daily public transportation and tourism landmarks, this was to be a different type of trip: to the Club Med Sandpiper in Port St. Lucie Florida. Would everyone be bored without places to go every day? All questions were answered within minutes of arrival. Greeted by cool glasses of lemonade and a huge welcoming committee of Club Med staff, it was off for an incredible dinner, followed shortly by a night of dancing. There was something for everyone each and every day. Sports enthusiasts enjoyed swimming, archery, tennis, football, golf, and more. There was tie-dye, cards, lounging, and other more sedentary activities as well. Although the constant supply of delicious food and beverages and access to interesting activities explains in part the enthusiastic response to this trip, it was clear that the Club Med philosophy was the key to it all. In just a few days it seemed like everyone from LiveWorkPlay was acquainted with almost all of the 100 or so Club Med staff at the resort. There were some lasting connections made, judging by the substantial number of Club Med staff that have joined the LiveWorkPlay fan page on Facebook! 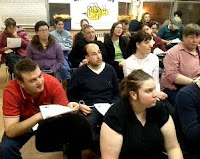 On February 25 a trip-planning meeting for 2010 was hosted at LiveWorkPlay headquarters. There were more options discussed than ever before, and participants went home to think it over. The way LiveWorkPlay supports travel for people with intellectual disabilities has been evolving over the years, with a key aim to offer increased flexibility. One of the goals of LiveWorkPlay trips is to help people with intellectual disabilities acquire the skills and confidence to enjoy their own independent travel plans. This is happening with increasing frequency, and travel support is increasingly being offered to help individuals make their own travel arrangements. Check out a video summary of the Florida trip by clicking on the image above right! 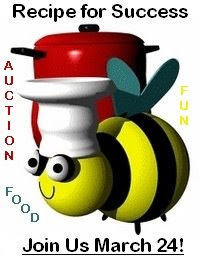 It's the most important LiveWorkPlay fundraiser of the year: The MBNA/Bank of America Recipe for Success Culinary Adventure and Charity Auction. Please note our new 2009 location, the Ron Kolbus Lakeside Centre (Britannia Park). Do ors open at 6:00, get their on time or you will miss out on a delicious free milkshake courtesy of The Works Gourmet Burger Bistro! It's easier than ever to get a ticket. The entire LiveWorkPlay network is already out selling tickets, but you can also order online, just bring your e-receipt with you. If you forget, don't worry, LiveWorkPlay will have a list of all those who paid online. To order online click on the image to the right. If you have attended Recipe for Success in the past, watch for a number of improvements to help the evening flow more quickly. As always we need your help with donations and sponsorships. 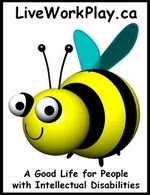 This is a difficult time for many individuals and businesses that have supported this event in the past, so it is more important than ever to connect with new contributors. LiveWorkPlay support for travel is not limited to SMILE, qualifying members of Journeys have their own travel opportunity coming in July through the ACES s ummer learning program. With funding support from the United Way/Ottawa Centraide, Last year was the first ACES trip, with two different cohorts enjoying three days and two nights in Montreal. Both excursions were very successful and there was a lot of enthusiasm to try it again in 2010. If you are a Journeys participant interested in ACES 2010 but not yet registered, you've missed the deadline! Please get in touch with Julie at 613-235-9550 x 222 immediately. CEO Keenan Wellar and President Julie Kingstone had the opportunity to represent LiveWorkPlay in attending the 10th Annual Community Living Ontario Communications Training Workshop. Keenan also delivered a workshop to share the LiveWorkPlay experience with using social networking tools like Facebook to building community support and promote inclusion. Conference presenters such as Terry O’Reilly (Host of The Age of Persuasion) and Bob Hepburn of The Toronto Star offered invaluable tips for working with both traditional and new media and engaging the public. 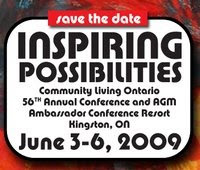 The next big Community Living Ontario event is the annual conference. This is a great opportunity for Ottawa residents, as the conference is just down the road in Kingston. 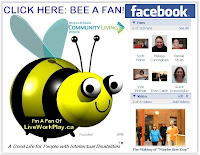 LiveWorkPlay is the English language Ottawa area affiliate of Community Living Ontario, and will be encouraging participation by self-advocates from Journeys and SMILE, as well as family members who can benefit not only from the fo rmal presentations and workshops, but also from spending time with inclusion-minded peers and professionals from across the province and the planet. Two teams of graduate students visited LiveWorkPlay in February and are now ready to start work on two research projects. Team one is working with SMILE participants and their experience with the OC Transpo bus operators strike in December/January, and team two is exploring the impact of SMILE travel, including the recent trip to Florida and the decision-making process for determining the next destination (below right: those interested in a 2010 trip discuss the options at a February 25 meeting). The critical link between researchers and LiveWorkPlay is Professor Raymond Leblanc, well-remembered for his involvement with the On Our Own Together housing projects in 2003-2004. The current collaboration between LiveWorkPlay and uOttawa is part of the Experiential Learning Service, which takes students out of the classroom to actively apply their university studies to real world situations, and in ways that benefit the community and not-for-profit organizations. We hope you have enjoyed this 27th edition of LiveWorkPlayNews. If you have received an email about this blog in error and/or you would prefer not to receive future LiveWorkPlayNews messages, simply click here and follow the simple instructions. That same web page can also be used by newcomers who would like to join LiveWorkPlayNews, so feel free to share the address with friends, colleagues, and family who might like to subscribe. Send story ideas to Keenan Wellar.